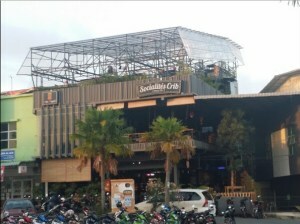 The concept of the industrial revolution in Europe earth which is identical with the image of a full pipeline building now comes in a new haunts bermana Socialite's Crib. You can enjoy a variety of menus, looking at the ceiling interior design in black, where there are many pipes are accidentally revealed to strengthen the impression of a classic. "Socialite's Crib is Industrial Cafe, meaning that emphasizes the interior design of factories where the age of the steam engine invented in Europe,"